Toronto, Ontario--(Newsfile Corp. - October 4, 2018) - Aurania Resources Ltd. (TSXV: ARU) ("Aurania" or the "Company") reports that significant copper mineralization has been discovered by two separate regional exploration teams in the Lost Cities — Cutucu Project ("Project") in Ecuador. The discoveries are approximately 20 kilometres (14 miles) apart: the first target is called "Jempe" and the other, "Kirus." The discoveries were made during exploration of two of the many magnetic targets identified from the geophysical survey conducted over the Project. Aurania Chairman and CEO, Dr. Keith Barron commented, "We are delighted to have linked outcropping copper mineralization with geophysical targets for the first time in our Project area. This gives us confidence that the numerous geophysical features that have been identified as prospective porphyry copper targets in the Project area have real potential." Occurs in tuff (hardened volcanic ash) that is typically deposited above, or lateral to, the copper-rich core of porphyry systems. These features, along with the low molybdenum content of the tuff, suggests that the copper mineralization found at Jempe does not lie in the core of the mineralized system: the core is likely to be associated with either or both areas of strong magnetism that flank the magnetic low evident in the geophysical data (Figure 2A). Final assays have not yet been received from routine rock-chip sampling that was done during the stream sediment sampling of the Kirus geophysical target. However, initial results show in excess of 1% copper and up to 59g/t silver — final copper results will be reported when they are received from the lab. As with the Jempe target, the host rock to the copper-silver mineralization at Kirus is finely banded tuff (Figure 3). The copper mineralization encountered in the first reconnaissance of Kirus lies on the northern edge of an area of anomalously strong magnetism that is approximately 4 km in diameter (Figure 2B and 2C). Figure 1. 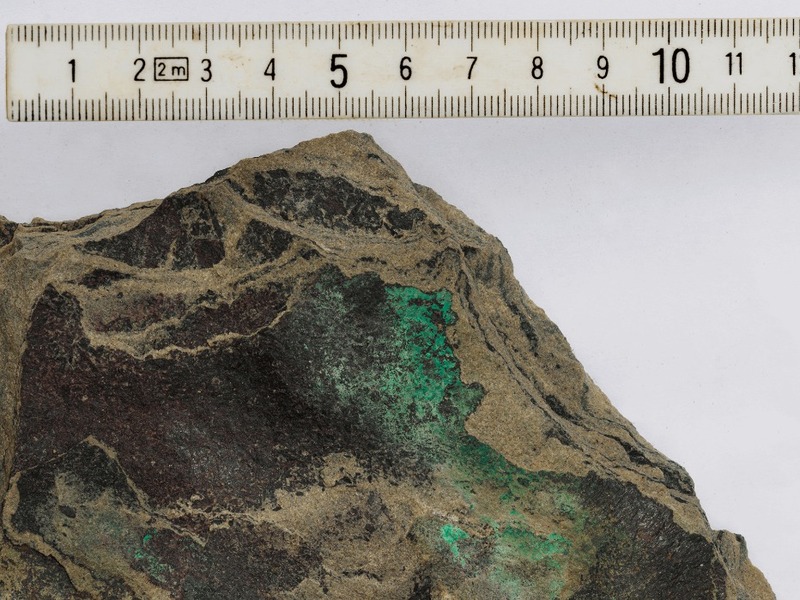 Copper mineralization (2.97 % Cu, green is malachite — a copper carbonate mineral) in sandy-textured tuff from the Jempe target. The black layers are secondary biotite alteration of hornblende crystals. Biotite alteration is typical of porphyry systems. Figure 2. Map showing the magnetic feature in the geophysical data from the Jempe (A.) and Kirus (B. & C.) targets. The colour range on the map is dark blue for the areas of weakest magnetism through to pink for the most highly magnetic areas. The location of the rock chip samples is also shown. Aurania's President, Dr. Richard Spencer, noted, "I was involved with the initial discoveries of the San Carlos, Panantza and Mirador copper porphyry deposits in Ecuador that are currently being developed. The discovery of this initial copper mineralization at surface at Kirus and Jempe on Aurania's property approximately 25 kilometres to the north of San Carlos and Panantza and approximately 75 km to the north of Mirador, is more impressive in the samples taken to date. It is also important to note that our copper mineralization occurs in tuffaceous rocks versus the occurrence in granitic rocks at San Carlos, Panantza and Mirador. This would suggest that we may have the full porphyry system preserved with little to none eroded off." The molybdenum values of the rock chip samples are relatively low in comparison to porphyry copper deposits such as Mirador, San Carlos and Panantza that lie along-trend in the Cordillera del Condor. Molybdenum is concentrated in the core of those deposits. The conclusion of this early-stage work is that both the Kirus and Jempe targets represent the upper parts of porphyry systems, and the porphyries are expected to lie at relatively shallow depth beneath, and lateral to, the reconnaissance sample positions. Figure 3. 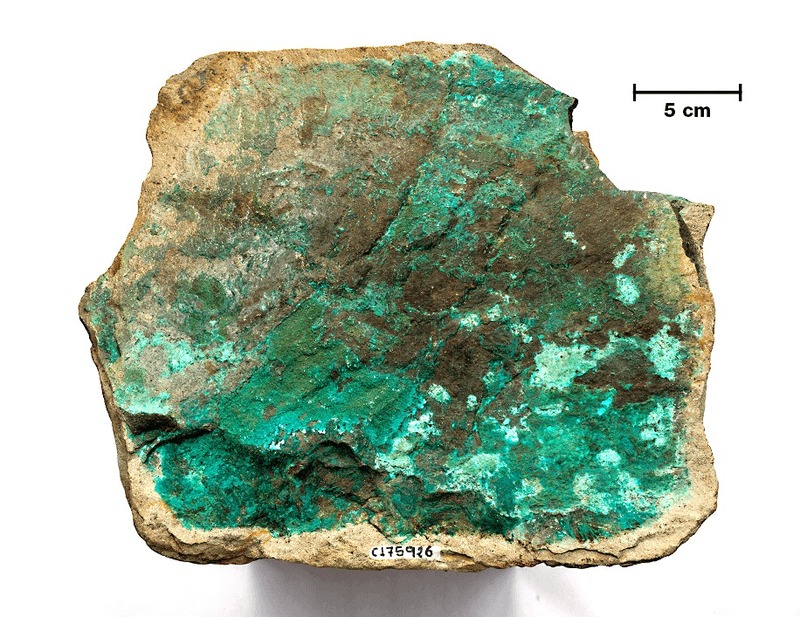 Copper mineralization (green is malachite — a copper carbonate mineral) in tuff from the Kirus target. The plan is to complete the stream sediment sampling program over the geophysical targets and to cover the catchment areas that are enriched in copper and associated metals, with ridge and spur soil sampling to refine the location and shape of the target. It is anticipated that Jempe and Kuris will join the list of targets being ranked for near-term scout drilling. The Lost Cities — Cutucu Project, is located in the Jurassic Metallogenic Belt in the eastern foothills of the Andes mountain range of southeastern Ecuador.